Bone grafting and ridge augmentation are two procedures that can be very beneficial for patients experiencing both cosmetic and functional periodontal issues. Since bone is the foundation of your oral structures, a deficiency can lead to loose teeth or potential aesthetic concerns. This lack of adequate bone density can be caused by such factors as trauma or periodontitis (severe gum disease). If the bone support gradually depletes, you may eventually need a tooth extraction. Our periodontic specialist, Dr. Daniel Lauer, is proficient at placing bone grafts to help restore the shape and integrity of patients’ oral structures. The procedure can be highly beneficial for those who have lost teeth as well as those who need better support in order to secure their teeth. Bone grafting is a technique that can actually regenerate lost bone, providing more solid support for your teeth. This can help you protect the function and appearance of your natural teeth, as well as improve your jawbone quality for potential dental implants in the future. The ideal candidates for bone grafting are those in overall good health who exhibit the need for increased bone volume. It is also important for these individuals to not have any medical conditions that could potentially interfere with the healing process after their surgery. Once you are determined to be a good candidate for bone grafting, Dr. Lauer will begin the procedure by first cleaning and disinfecting the gums. Once your gum tissue has been sterilized, Dr. Lauer is able to surgically graft small pieces of donor bone material to the existing bone around the roots of your teeth. Over time, these grafts should fuse to your natural bone and strengthen the foundation of your teeth. 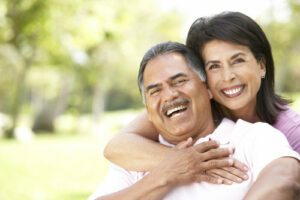 By rebuilding these areas of bone recession, the health and appearance of your gums should improve as well. Bone grafting can also be a useful technique in some dental implant procedures. For patients who do not have adequate bone density to accommodate an implant, there are cases in which a bone graft treatment can be performed to add extra volume to the jawbone and increase the chance for successful (and permanent) implant results. As a board-certified periodontist, Dr. Lauer is highly knowledgeable on the structures surrounding the teeth and how best to rebuild them should they recede with time. For those interested in dental implants to replace their missing teeth, he may recommend they first undergo bone grafting to establish a stronger, denser jawbone to support the titanium implant posts. This is often necessary to ensure implants properly fuse with the jawbone for a long-lasting, stable teeth replacement. Bone grafting can address a variety of jawbone deficiencies—whether this is to prepare for implants or to simply preserve the jawbone structure. It is also commonly used in ridge augmentation procedures. Ridge augmentation can help patients who have experienced jawbone recession after tooth loss. Patients who have had dental implants placed in areas of missing teeth sometimes experience an indented appearance along the gums and jawbone where the implants reside. This indentation can cause an unnatural appearance, and be very hard to clean during routine brushing and flossing. Ridge augmentation with bone grafting and Emdogain™ – a revolutionary gel-based solution that can actually regenerate soft gum tissue and bone – can fill the indented areas caused by jawbone recession. The procedure can also be beneficial immediately following tooth extraction to help minimize this bone loss. With ridge augmentation, you can achieve a more balanced and symmetrical gum line around the dental implant. If you would like more information on ridge augmentation and bone grafting, please contact Precision Periodontics & Implant Dentistry. We can also help you schedule a consultation with Dr. Lauer, during which you can receive more personalized details about the health of your jawbone and whether grafting is the best option for your needs.